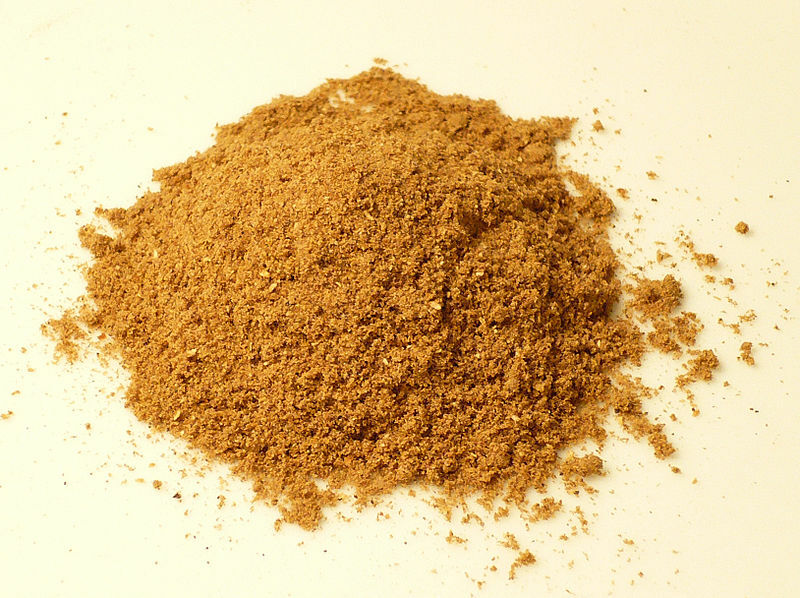 Garam masala from Hindi garam ("hot") and masala ("mixture") is a basic blend of ground spices common in Indian and other South Asian cuisines. It is used alone or with other seasonings. The word garam refers to spice intensity, not heat; Garam masala is pungent, but not "hot" in the same way as a chili pepper. 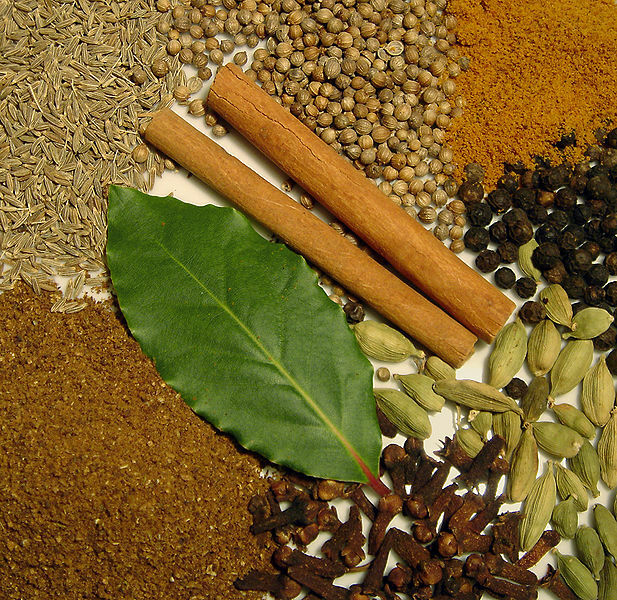 The composition of garam masala differs regionally, with wide variety across India. Some common ingredients are black & white peppercorns, cloves, bay leaves, long pepper (also known as pippali), black cumin (known as shahi jeera), cumin seeds, cinnamon; black, brown, & green cardamom, nutmeg, star anise and coriander seeds. Varying combinations of these and other spices are used in regional variants of garam masala, none of which is considered more authentic than another. Some recipes call for spices to be blended with herbs, while others grind the spices with water, vinegar or other liquids such as coconut milk to make a paste. In some recipes nuts, onion or garlic may be added. The flavours may be carefully blended to achieve a balanced effect, or in some cases a single flavour may be emphasized for special dishes where this is desired. Usually a masala is roasted before use to release its flavours and aromas. Left: Ingredients for garam masala. The order in which spices are added to food may be very elaborate in some dishes. In the case of the Kashmiri speciality roghan josh, for example, coriander, ginger and chilis are each ground individually. A garam masala of cloves, cinnamon, cardamom, fennel, mace, cumin, turmeric and nutmeg is separately prepared. The cook tastes the dish carefully to determine the precise moment when the next spice should be added. The order is coriander initially, then the ground ginger, then the garam masala and finally the chilis. In the chicken dish Murgo Kari (chicken curry) the procedure is also precise. First the chicken is fried and removed from the pan. Onion, garlic and fresh ginger are added to the pan and cooked slowly for 7 to 8 minutes. Next cumin, turmeric, ground coriander, cayenne and fennel are added with water and fried for a minute or so. Next tomato concassé is added with cilantro, yoghurt and salt. The chicken is returned to the pan and more water is added. Finally some garam masala is sprinkled on top, the pot is tightly covered and the dish cooks another 20 minutes before serving.